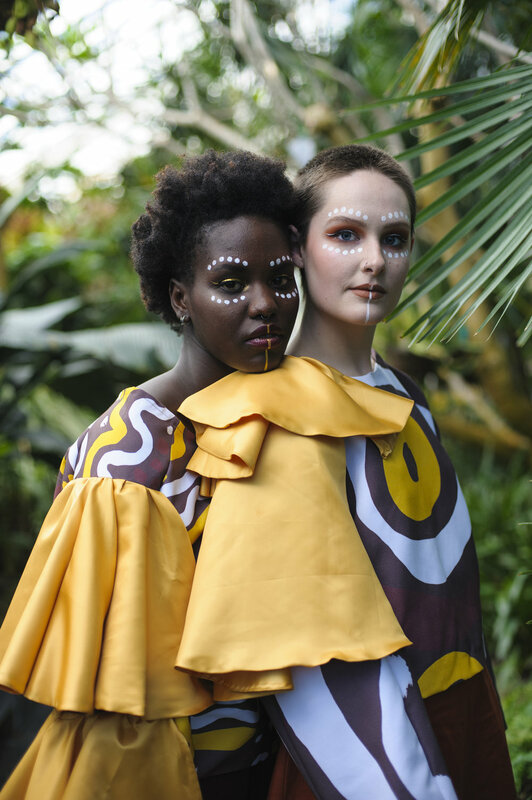 Tsega Gebremedihin’s collection ‘OMO’ embraces the rich and ancient cultural practices of body painting within the four tribes of the Omo Valley in Ethiopia. Through her collection Tsega seeks to create a cultural conversation, connecting her ‘making’ process to her Ethiopian heritage through the process of fabric printing. This process has led her to share with others her heritage and identity, while reconnecting, recreating and acknowledging the four tribes. The earthiness of the print and materials she uses has been influenced by the natural substance that the tribes use to paint their bodies, while the process of printing the fabric began with hand-painting and progressed into digital application enabling her to create clothing which has a long-lasting cultural experience.